The same can be said for Cameron Reddish, who measured 6'7 in shoes with a 7'1 wingspan and a 203-pound frame. Standing 6'4.75 in shoes with a 6'8 wingspan at 177-pounds when he entered high school, Reddish has grown into one of the top prospects in the class of 2018 and could conceivably play some power forward at the college level, even if his skill-set is that of a wing. He could stand to continue packing on muscle, but his dimensions already compare favorably to NBA small forwards like Michael Kidd-Gilchrist, Harrison Barnes, and Nicolas Batum. Reddish did not have the most productive or impressive camp, but its notable to at least mention the fact that he's grown about an inch a half and added 11 pounds to his frame in the past year. Judging by his body type and age, just having turned 16 years old, it wouldn't be surprising if he continues to grow. Reddish has an ideal basketball frame, which is likely the main reason why he's generated as much attention as he has in Philadelphia at such an early age, but is still a very early stage of his development from a skills standpoint, even compared to other players his age. He has some athleticism and ability to change speeds, but looks extremely passive on the floor and tends to blend in completely and rarely utilizes his physical gifts, seemingly not knowing how to at the moment. He settles excessively for pull-up jumpers and seems to avoid contact around the basket. He has terrific tools on defense with his 6'10" wingspan, but does not display a high energy level and often leaves you wanting a little bit more here as well. 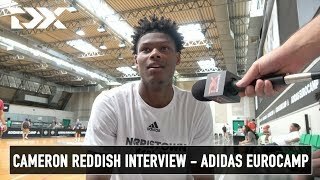 A video interview with high school small forward prospect Cameron Reddish at the Big Strick Classic.